If you’re at all involved in association management, you know how challenging it can be. Not only do you have to attract and recruit new members -- but have to get them engaged them once you have them. Not to mention retaining members long term. It can feel overwhelming, even impossible. The good news is, it can be done, and there are groups out there that are achieving these lofty goals. Below we’ve compiled experts’ top tips on how to attract, engage, and retain your members. First, of course, we all want more members. The bigger question is, are your current efforts getting you there? What can you do beyond offering membership discounts? The first thing to do is benchmark, Membership Marketing has some great benchmarking reports. In their most recent report, they break down two categories of association management growth challenges -- “internal” and “external." *Image courtesy of Marketing General Inc. Discuss with your management team which challenges resonate most with you. If you know that your greatest challenge is that you're not fully communicating the true value of your membership, that gives you a clear place to start. Consult with colleagues, marketing experts, and your members, ask them how they would communicate your membership value. Once you've benchmarked, you're ready to add value to your membership. Don't panic, adding “value” doesn’t have to cost you. That concept can seem too good to be true if you’re new to affinity programs, but in fact, it is true. Popular providers like Office Depot, Disney, AMC, etc. agree to offer deep discounts due to the customer volume associations bring in. It’s a win-win, better price for your members, more customers for providers. It's a bit like Groupon. Theme parks -- 40% off visits to Disney, Universal Studios, etc. Since providers want volume, we can give you these discounts free. In other words, there truly are no strings for you. And it only takes about two minutes to sign up. In short, affinity programs are a great way to add value without increasing memberships costs. It’s a quick and easy way to make your association more valuable, and attractive to new members. Put the referral concept to work for yourself. Because members usually sign up due to fact that someone told them to. It can be as simple as asking them to give you an email introduction to friends or colleagues who might be interested. You can even offer a referral perk (like an Amazon gift card) for every member they refer. Ask them to post on social media why they love being apart of your group, etc. You can even interview them and share it on your Facebook page. There is an extraordinary group of members in your membership. They are the innovators...they are acutely aware of the pressures from technology, regulations, and consolidation. Many members are riding out the storm, but not this group. This group wants to be part of the solution. They are our innovators. Bring your marketing challenges to your own “innovators” -- no one will understand your struggles like they will. You can also use tools like Buzzsumo to identify industry influencers. Find someone you like and invite them to guest post on your blog. Team up with a complimentary association for a webinar. 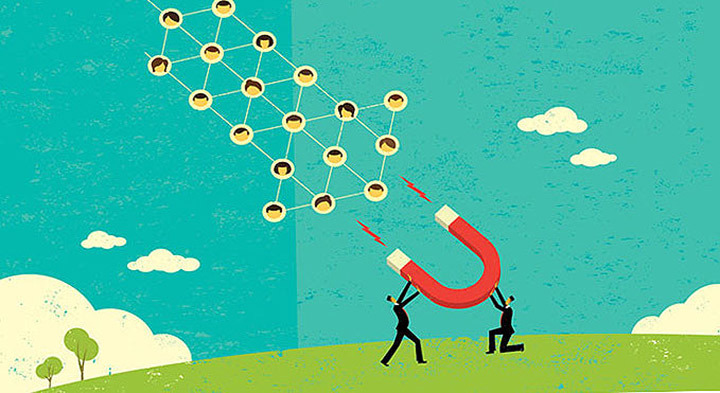 Both engaging your own influencers and co-marketing are great ways to attract new members. Not surprising. Just like you find your gym membership more valuable when you actually go to the gym. The problem is getting there, the problem is engagement. So how do we get them to the gym? The first step is remembering that human nature is to do what is easy, and avoid what is not. Research confirms it. For example, 53% of users abandon a mobile website if it takes longer than 3 seconds to load.” In other words, your members are busy and in a hurry. So bottom line, if you want engagement it has to be stupid-easy. If they cannot navigate your website, app, resources, or benefits they will not engage. Period. If your emails and blogs aren't skimmable, they won’t get read. Audit yourself by having an outsider or new member go through your resources and rate their experience. Ask them where they lost interest or got stuck. It’s so simple, yet it’s one of the absolute best things you can do. Another great way to engage members is to think outside the box. Starting with email -- by all means, use email campaigns, we recommend them. But it’s also a great idea to be creative and take things to the next level. For example, here's a brilliant example of creative marketing. Basically, it’s way of creating specific members/subscription lists on Facebook. Then you send them direct messages (similar to email) via the Facebook Messenger app. Creative tactics like these can you help you stand out from the crowd and keep your members engaged. Finally, now that we’ve gone to all this work to attract and engage members, how do we make sure we keep our hard-won members? Another key point is that research shows any type of interaction, between your association and your members, increases retention. Whether it's attending a webinar or meeting -- interactions create retention, because the higher the number of interactions, the greater chance of long-term retention. Therefore, your first focus needs to be creating opportunities for interaction. “We’ve been able to identify what our target audience is responding to, what types of content they’re looking for, and really approaching it in terms of a problem-solution orientation, so if they’re looking for specific types of recipes that make their lives easier, that’s the type of content we want to deliver,” she said. “Doing research to identify what your audiences respond to will help drive engagement and effectiveness of whatever tactics you’re implementing." To put it simply, to make sure they were relevant, they became highly strategic.